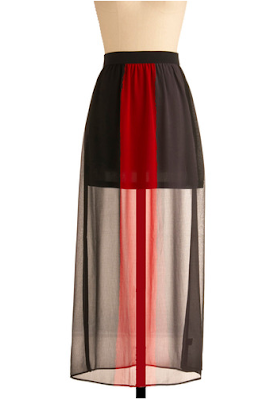 Want a miniskirt and maxi skirt in one? Well, then, the paneled maxi skirt is most definitely for you! Also called the illusion skirt, this skirt has become a major trend of the season thanks to pieces that came down the Chloe Spring 2011 runway (like the look seen above). Part seductive temptress, part bohemian innocent, this skirt has had major lasting power this season! Check out some takes on the trend after the jump. This cream-colored creation is full of gorgeously tiered goodness. Prairie chic at its absolute best, thanks to a long layer of floral-embroidered tulle. Go for a bold look with this bright, colorful number. Red and black and sassy all over! This skirt has got personality in spades.